Vegeta's Galick Gun can blow up Earth. Confirmed because Goku can sense Ki. He knows that much energy will blow up the earth. He's desperately counter Galick Gun with Kamehameha because of that. If it can only blow up a portion of Earth, he would simply dodge it, and fixing earth is only 7 Dragon Balls away. Cell is a solar buster. Confirmed by multiple Z-Fighters, who can sense Ki. Confirmed by guides, and other media multiple times. There is no reason to doubt it. Beerus stated to be able to wipe out the Kaioshin Realm, which is 1/5 of the universe. If you think that's the highest level of Beerus, you're dead wrong. It was stated he CAN perform such feats when he's WEAKER than Majin Buu. That same Beerus right now knock out SSJ3 with 2 strikes. The same SSJ3 that can beat Buu in direct match. SSJG Goku is around 60% to 70% of Beerus, in Battle of God. Goku unable to lift 40 tons. Also confirmed. Because I don't buy it when it's all their power put into it. When Odin goes all out, galaxies get blown away and the multiverse itself shakes. Nevermind Marvel can be even MORE inconsistent than DBZ anyway. And that is the case. Vegeta needed to make sure the Final Flash he was putting everything into made no contact with the earth and he could only do such by narrowing the beam, not controlling the AoE of the blast. Goku when he fights Cell whose not even at full power but still "revved up" warns him he'll blow the earth up with a Kamehameha while in that state. If DBZ characters can do what you say, neither of the aforementioned would have been issues. And he shook the multiverse but wasn't even his own power. 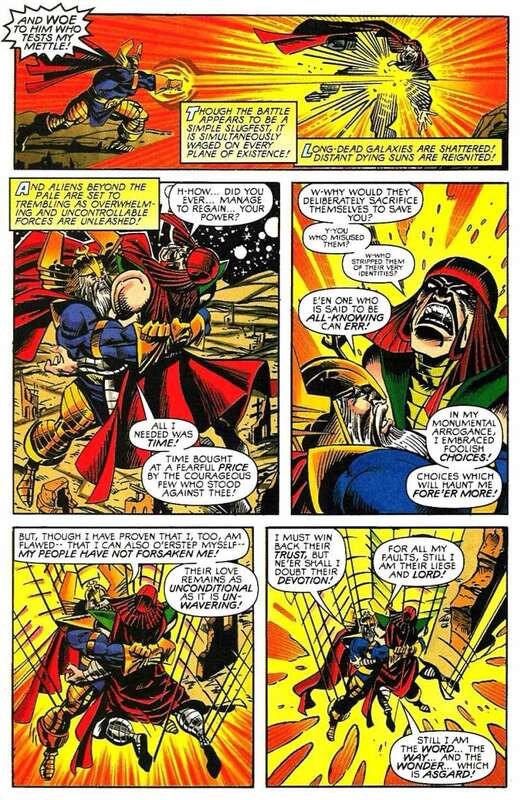 Im pretty sure he also can co trol his AoE otherwise he woyld have blown the planet when he fough thanos. Sounds familiar?Why Odin statements should be take seriously but not DBZ? Kinda of hypocrite if you believe that, I hope you don't. Vegeta could control his AoE at last moment that's why he didn't blew up earth. And goku destroying earth is an understatement . if you hit a paper with the power to destroy earth you still are you going to destroy the paper. I could find tons of poor collateral damage in fiction yet are above planet lvl and some even galaxy. Yet people are drama queens when it comes to dbz . And he shook the multiverse but wasn't even his own power. Im pretty sure he also can co trol his AoE otherwise hebwojkd habe blown the olanet when he fough thanos. Sounds familiar?Why Odin statement and poor collateral damage should be take seriously but not DBZ? Kinda of hypocrite if you believe that, I hope you don't. Vegeta could control his AoE at last moment that's why he didn't blew up earth. And goku destroying earth is an understatement . if you hit a paper with the power to destroy earth you still are you g to destroy the paper. I could find tons of poor collateral damage in fiction yet are above planet lvl and even galaxy. Yet people are drama queens when it comes to dbz . what do you mean? It says "long dead galaxies are shattered" simply as a result of their fight. It's not like when a character claims he can bust something, this is literally explaining what is happening in that very moment. It doesn't show it, but the fact the narrator is explaining that it is happening means that it is, no exceptions, no room for skepticism. If the narrator/author states it, it is fact, not just a mere statement. you need the power of 20,000 supernovas to destroy the solar system. using real physics wont make any sense in DBZ, Whis has sated he has done it before , Toriyama has implied it . Also he destroyed stars when he was half asleep pissed in the morning . if anything thats more proof of his solar system statement. of course we can scale using power scaling(from DB heroes) and we both know how thats going to end. A star contains almost 99% mass of solar system. A single supernova will destroy a solar system and beyond. im taking into account the space between planets. after all you do need a blast with that much AoE. If type Ia supernova can destroy all the planets of a system why would you need more than that ? The blast will cover all the spaces between the planets. So the outcome will be same. this is FNF tho, not super.